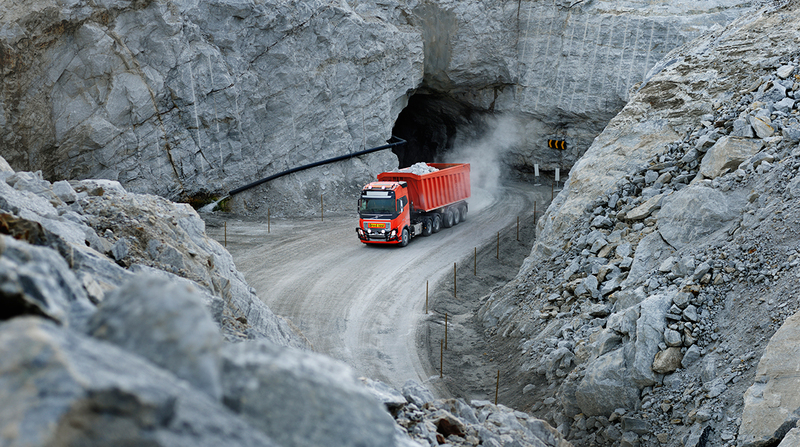 Volvo Trucks announced it has signed a “landmark” agreement in Norway with mining company Bronnoy Kalk AS that calls for the truck maker to haul commercial loads of quarried limestone across mine property using six fully autonomous heavy-duty trucks. The Volvo FH models — pulling trailers with hydraulic tipping gears — will travel 3½ miles from Bronnoy Kalk’s open pit mine, including through tunnels along the route, to deliver the loads to the mine’s dockside stone crusher. The crusher will pulverize the limestone before conveying it into the hold of a waiting cargo ship. Initially, the operator of the wheel loader in the pit calls for a truck, loads the trailer with limestone then, when full, sends the truck away to rendezvous with the crusher. Under terms of the agreement, the mining company will not own the trucks. Instead, it will buy a “total transport service” and pay Volvo Trucks on a per-ton-delivered basis, according to the truck maker. Successful tests of the trucks have been carried out, and the transport service will be fully operational by the end of 2019. This agreement follows recent successful automation projects involving mining, sugar cane harvesting and refuse collection, according to Volvo Trucks, a unit of Gothenburg, Sweden-based Volvo Group. “We are proud to be able to present an autonomous solution that will meet the challenges of our customers in terms of safety, reliability and profitability,” Volvo Trucks President Claes Nilsson said in a statement. Meanwhile, unmanned self-driving vehicles are on private sites in several places worldwide, including autonomous straddle carriers at the Port of Los Angeles and autonomous mining vehicles in Australia. But Volvo Trucks appears to be the first to adapt heavy-duty tractor models for fully autonomous operation. But online, some questioned the approach. “I’m surprised nobody sees this as Volvo taking jobs away from drivers. That’s all I get from this,” one commenter posted. Another commenter urged Volvo Trucks to instead find a solution for long-distance transport so that drivers don’t have to spend several weeks away from home.